The first - and at one point, largest - empire in Avistan after devastation of Earthfall, Taldor has stood for millennia, and though its neighbouring nations snicker at its lavish parties and out-of-touch nobility, none dare challenge the mother empire's might! With 6 millennia of history spanning the breadth of a continent, Taldor is a land of long-buried secrets and ruins, partnered with modern cutthroat dramas and political action. Secrets and treasure abound across Taldor - many forgotten, but far more deliberately buried. Will you fight to preserve the glorious traditions of the past, of will you pave the way for a reformed Taldor to attain new heights? A thorough gazetteer of Taldor's major prefectures and provinces including details of the reigning nobles of each and over 70 points of interest across the nation from Anio's Crown and its endless royal necropolis to the militarized city of Ziman. An overview of Taldor's government, foreign relationships, and society. Nearly a dozen adventure sites tied to Taldor's past glories and modern decay from ruined cities to lost valleys of the dead. Nine new monsters perfectly adapted to life in Taldor, including the corrupting, giniver, perfectly suited to hiding in plain sight, and testaments to noble excess such as the titanboar and the blood-bathing baetriov. 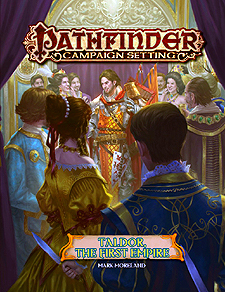 Pathfinder Campaign Setting: Taldor, The First Empires is intended for use with the Pathfinder campaign setting, but it can be easily adapted to any fantasy world.